So that you know, I am not suspicious (knock on wood). I take a rather practical approach to life and try my best not to get bent out of shape. At my age, it’s rather difficult to keep my shape. I try to keep my guard up, but no matter what I do, I drop it. I was most gracious for this apple fritter. Nothing raises your spirits and encourages you to do your best like an apple fritter. I know my wife and I disagree as to the nature of these apple fritters so it surprised me that she brought one to me. My insistence is that an apple fritter is an apple and an apple is an apple. She, on the other side of the breakfast table, insists that it is a doughnut. We have never resolved this difference in our relationship. When she brought me an apple fritter I was a little bit surprised, but was thinking deep in my heart it may be I have convinced her that an apple fritter in deed is a fruit. I smiled most graciously, thanked her and enjoyed the apple fritter like I enjoy every apple fritter I eat. It was the highlight of my afternoon, I can tell you that. Nothing more was said about it because I do not like to spoil a good thing. I just enjoyed it and went on thinking that perhaps we have come to a conclusion about this contradiction. Without thinking, I took it, smiled and thanked her most graciously for this afternoon treat. Nothing bolsters my day more than a warm apple fritter. 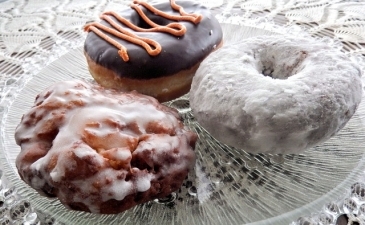 Nothing goes better with a cup of coffee than an apple fritter. I am quite convinced that in heaven we will enjoy apple fritters. With me whenever I have an apple fritter in the afternoon the day goes by so smoothly. I enjoyed that apple fritter to the nth degree, whatever that may mean. I did not think much of it, because you should just enjoy your day and whatever blessings come, like an apple fritter, just enjoy it to the best of your ability. Let me repeat that I am not a very superstitious person (knock on wood), but I do like to take precautions. Once it is over, I like to move on. Then on Thursday, the inconceivable happened. For her to bring me one apple fritter was a wonderful thing, and I deeply appreciate it and did not give it too much thought. For her to bring me the second apple fritter was a little suspicious, but I was not going to say anything or spoil the moment or discourage her in any way, so I accepted it. Now the third apple fritter, three days in a row has made me more than suspicious. I do not want to be judgmental here. I certainly don’t want to do anything that would spoil the next apple fritter that might come. But I was suspicious. I mean, I was very suspicious about the whole scenario. For her to bring me three apple fritters in a row, knowing that she does not like apple fritters, caused me to rethink the whole situation. Why, for example, was she doing this? What was she expecting from me in return? How much trouble am I really in now? All of these questions jammed my brain so that I could think of nothing more. Has she come over to my side concerning these apple fritters? Or, was she setting me up for something? As I slowly munched on the third apple fritter, my mind went a million miles an hour. My mind was going so fast I almost could not enjoy the apple fritter. Never fear, I took the time to enjoy the apple fritter, then I resumed my suspicious thinking. The first thing I thought about Friday morning when I got up was the suspicious apple fritters. Was she going to bring me another apple fritter today? Would I find out today the scheme behind this apple fritter scenario? Friday afternoon as I was involved in some work my wife passed by and said, “How’s everything going? You getting some work done?” I nodded and she continued walking without presenting me with an apple fritter. To this day, she has never mentioned the apple fritter scenario. I, loving life in all its amenities, have never questioned her about it. What she meant by it and what was happening, I probably will never know. Thinking about this I was reminded of what David once said, “This is the day which the Lord hath made; we will rejoice and be glad in it” (Psalm 118:24).